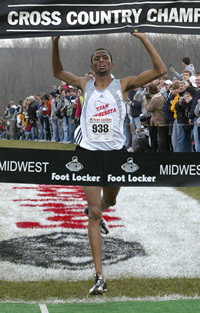 Kenosha, Wis., November 25, 2006 – Hassan Mead of Minneapolis, Minn., and Emily Sisson of Omaha, Neb., won the Foot Locker Cross Country Championships (FLCCC) Midwest Regional at the University of Wisconsin-Parkside in Kenosha, Wis., today. The boys’ race remained close from the start to the finish and was dominated by a tight pack of runners all fighting for the title. The runners sprinted through the last 200 meters, with the top seven runners still neck-and-neck. With 10 meters remaining, Mead, a senior at South Minneapolis High School, rushed ahead to claim victory, with a time of 15:05. Anguel Tolev, a senior in Northglenn, Colo., finished second in 15:10, and Elliott Heath, a senior in Winona, Minn., placed third in 15:10. The girls’ race began with the top two positions clearly defined by Emily Sisson, a freshman from Omaha, Neb., and Kaitie Vanatta, a sophomore from Arvada, Colo., with the lead only growing stronger as the race continued. Katelyn Bastert (Carthage, Ill.) and Betsy Bies (Yankton, S.D.) led a pack of runners 50 meters behind the top two competitors. As they approached the finish line, Sisson made her move and sprinted ahead of Vanatta to win the race in 17:13, with Vanatta finishing second in 17:16. Emily Infeld of University Heights, Ohio, finished third in 17:43. Bastert and Bies placed seventh and eighth respectively. Mead and Sisson are both first-time FLCCC national qualifiers. The top ten boys and the top ten girls of the seeded races qualified to compete against runners from the South, West, and Northeast regional meets in the Foot Locker Cross Country Championships National Finals, which takes place Saturday, Dec. 9 at Balboa Park in San Diego, Calif.
Kenosha , Wis. , Nov. 25---A Minnesota senior and a Nebraska freshman claimed Foot Locker Midwest Regional cross country titles here Saturday over the 5,000-meter course at the University of Wisconsin-Parkside. Running under partly cloudy skies with the temperature in the high 50s and with little wind, Hassan Mead, the Minnesota Class AA champion from Minneapolis South High School , closed well to take the win in 15:05 , five seconds ahead of the 2-3-4 placers who crossed the finish line in 15:10 and whose places were separated by the camera. Sisson, a ninth-grader at Omaha Marion High School who is only in her third year of running but won a state title, overtook Kaitlyn Vanatta of Arvada, Colo., late in her 5K race and then held on to win in 17:13, three seconds ahead of the runner-up. Mead and Sisson lead the 10-runner boys' and girls' teams from the Midwest region that will vie in the 28 th annual Foot Locker National Championships Dec. 9 in San Diego . Teams will also represent the Northeast, the South and the West. The blanket finish by the nine national qualifiers after Mead was one of the closest in the history of the meet, with the fifth, sixth and seventh placers at 15:12 and 15:13 and the eighth through tenth placers within six seconds of sixth. In contrast, the girls' race was a bit more spread out after the tight battle for first, with the tenth and final national qualifier 51 seconds behind Sisson. The remaining nine qualifiers out of the boys' race were Anguel Tolev, a senior from Northglenn, Colo., (Thornton H.S. ), second in 15:10; Elliott Heath, a senior from Winona, Minn., third in 15:10; Emil Heineking, a senior from Chardon, Ohio, fourth in 15:10; Evan Appel, a sophomore from Littleton, Colo., (Dakota Ridge H.S. ), fifth in 15:12. Also, Joseph Manilafasha, a sophomore from Denver (North H.S. ), sixth in 15:13; Robert Moldovan, a senior from Fort Wayne , Ind. (Northrop H.S. ), seventh in 15:13; Richard Medina, a senior from Grand Junction, Colo., eighth in 15:18; De'Sean Turner, a senior from Indianapolis (Warren Central H.S. ), ninth in 15:18; and Dan Chenoweth, a senior from Geneseo, Ill., tenth in 15:19. The eight other qualifiers behind Sisson and Vanatta were Emily Infield, a junior from University Heights , Ohio (Beaumont H.S. ), third in 17:43; Alex Gits, a senior from Edina , Minn. , fourth in 17:44; Kristen McGlynn, a senior from Bailey, Colo., fifth in 17:50. Also, Allison Eckert, a senior from Sioux Falls, S.D. (Roosevelt), sixth in 17:56; Katelyn Bastert, a senior from Carthage, Ill., seventh in 17:59; Betsy Bies, a senior from Yankton, S.D., eighth in 18:01; Marissa Treece, a senior from Maple City, Mich. (Glenlake), ninth in 18:03; and Alexandra Banfich, a junior from Plymouth, Ind. (Culver Academies), tenth in 18:04. High school runners from Colorado , Illinois , Indiana , Iowa , Kansas , Michigan , Minnesota , Missouri , Nebraska , North Dakota , Ohio , South Dakota and Wisconsin are eligible for the competition.